Hacking Calculords part 2: Who needs fingers? When we last left off, we had a handy-dandy algorithm that used dynamic programming to find the optimal solution to a Calculords level in a sane amount of time. 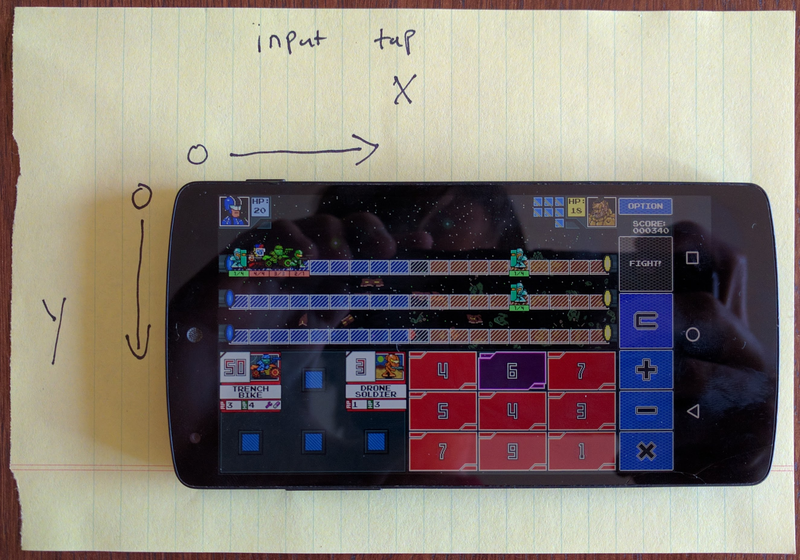 The biggest downside was that I still needed to manually transfer a bunch of numbers from the screen to the algorithm, and then painstakingly tap the results back into the phone, one by one. Since there was a puny meatbag involved, there were a lot of errors and I couldn’t live without the 1.5x “Perfect!” bonus. The answer was crystal clear. What follows is the second entry in the journal of my journey to math and madness. After an hour of talking at my computer, I concluded that there was no native voice-activated Android control system on OSX. Dismayed, I turned to the next best thing: the adb tool. adb lets a hacker interact with an Android device without touching it at all. I’m sure iOS devs are applauding right now at the thought of never needing to touch another dirty droid again. Why, you may ask, do we need to take a screenshot of a device that’s right in front of us?!? Dear reader, you underestimate my ability to screw things up. During manual input, I need to rapidly glance back and forth between phone and computer. There is an abundance of things in between, such as a keyboard, pizza, and occasionally my cat. Any one of these things could momentarily distract me—flipping bits in my brain—and I’d enter the wrong number, causing minutes of lost ‘productivity’. The obvious answer is to double-check my work but then we’d run into the infamous Two Generals Problem, where two generals were having a nice lunch but the waiter got lost & the kitchen never received their order, so they decided to give up the whole war thing and become distributed systems experts. Hurrah! Now we can procrastinate slightly faster and with fewer mistakes than ever before! We want to execute a shell command that sends a tap event to a set of coordinates. Finding the right coordinates turned out to be a backbreaking journey. On the surface, things are simple. adb provides a getevent function that echoes out all the details of events on the device, including the x/y coordinates of the event. But this is software, so we should be suspicious of anything simple! Annoyingly the coordinates are in hex, though that’s trivial to convert. However, these are the wrong coordinates. Converting them to decimal and sending a tap will trigger a tap in a entirely different location! adb must be a politician or a UI developer as its position is relative. This difference is not documented anywhere that I could find (you read it here first, folks!). 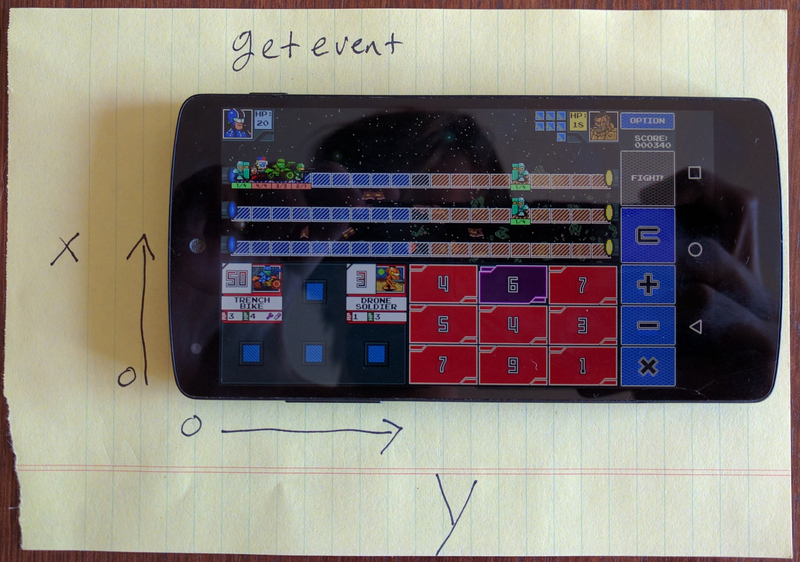 Once the tapping was set up, we can automagically enter in the best solution (‘best’ as in ‘deploys the most cards’, with no regard for order or overall strategy). Our AI places all of its units in the top lane. 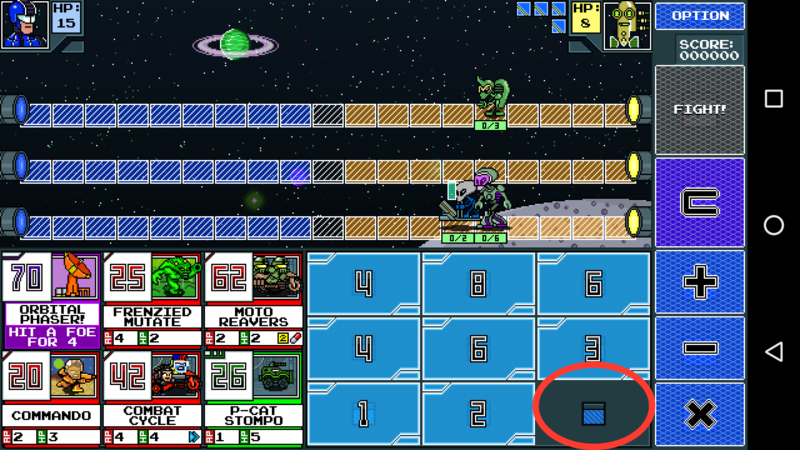 As it turns out, Calculords isn’t calibrated to deal with someone deploying ALL of their troops every time. Ninja Crime made the fatal mistake of assuming their fans weren’t that dementedly obsessed with Calculords. Our overwhelming firepower absolves the need for strategy. We’ll deploy ~6 troops every turn (some power-up cards are in the deck, other cards deploy multiple units). Every unit deployed moves the column ahead one square. The standard pace is 4 squares/turn, so putting everyone in one lane speeds up our victory by 2.5x. Later enemies have abilities that can restrict what lane you place troops into. I solved this by crying a lot and dropping down to manual control. A more clever solution is left as an excercise for the reader. With neck intact and all of my x’s dotted and y’s crossed, I thought I was in the clear. Then a terrible, awful thing happened: I leveled up. After a string of major victories on the field of battle, I was awarded a ninth and final integer to bring with me into the trenches. This drove the running time of the solver algorithm from an upper bound of 90 seconds to an average time of Out of Memory. V8-driven JS isn’t very memory-efficient. This let us build out our wide tree of recursion while still keeping the number of calculations relatively low. Rust, on the other hand was stubborn. Rust allows nested functions, but the coder must make a choice between accessing variables in the parent scope (via a closure) XOR recursing. This allowed me to have a global dictionary of visited paths, albeit a slightly strange one. This may be standard practice in the general Rust community– I’m just a newcomer. One advantage of Rust is that converting this code to use multiple threads was fairly simple (though I still needed a global mutex, which meant that multithreading didn’t help much). Phew - not only are we not dying on n=9 but it’s running ~2x faster! Memory consumption also drops by a massive amount, with Rust using about 12MB where JS chewed up over a gigabyte. When we started, we had a neat algorithm. Now there’s a solid UI around it, programmatic interfacing with the device, and significant speed boosts from a lower-level language. On the other hand, I still have to type in the numbers. Next up is the thrilling conclusion wherein we’ll build a neural network to recognize digits to save us from all that tedious typing.